“We shape our buildings; thereafter they shape us,” Churchill once said, and Canterbury’s pioneering company, PurePods, is leading from the front to ensure we are in the best possible shape. Humans’ stress response reduces just moments after entering a green space, and the term ‘biophilia’ is defined as the inherent human inclination to affiliate with nature. Glass eco-cabins PurePods are the essence of biophilic design, incorporating natural materials, natural light, vegetation, nature and views and other experiences of the natural world into a minimalist luxury cabin. A sojourn in a PurePod is a unique, lifestyle experience. 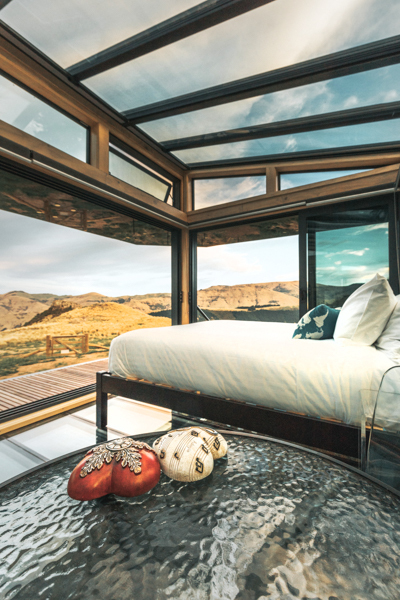 Stephanie Hassall, CEO of PurePods says the twin goals of the company are to have the smallest ecological footprint possible, while providing luxury and 360-degree views. 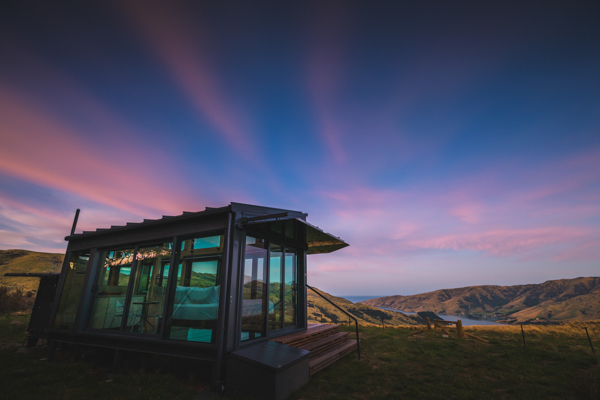 Privacy is key: each PurePod is located on private land, with fabulous views well away from all human activities. The experience starts as soon as you pull off the main road and leave the world behind. From your carpark, it is a 10 to 30-minute walk (depending on which PurePod you have chosen) with your overnight bag, through an indigenous nature trail. Once there, native planting is visible under you, the sky above you and the views through three walls. The buildings are PurePods’ trademarked and patented design, including the in-floor heating system set into the all-glass floor. Of course, PurePods use the expertise of local craftsmen, and from the beginning Coombes Sheet Metal and Fabrication has supported Purepods’ innovative designs by constructing components for the water and heating systems, and weather-proofing panelling, enabling it to perform in an exposed and remote natural environment. The newest PurePod is at Pōhue, located high above Port Levy, where the view is rolling tussocks, down to the bay and out to the Pacific Ocean. Rock Formations (named by the original WWII Veteran owner’s Greek bride), known to climbers as The Acropolis and The Monument, are in front of and behind you. Choosing which PurePod to book online is the most taxing part of the experience. The PurePods are identical, but each setting is unique: mountain, sea, bush, winery, and the seasons bring further variation: snow views, or golden grasses? You can book the next available PurePod, or a specific one, or why not PurePod-hop and try them all!